If you’re going to work on your car, it helps a hell of a lot to have a Haynes Manual. They can be a bible for any shade tree mechanic, and will help you get going again. And now that’s true, even if you’ve got an F-14 Tomcat and you’re idea of “getting going” is smashing through the sound barrier. 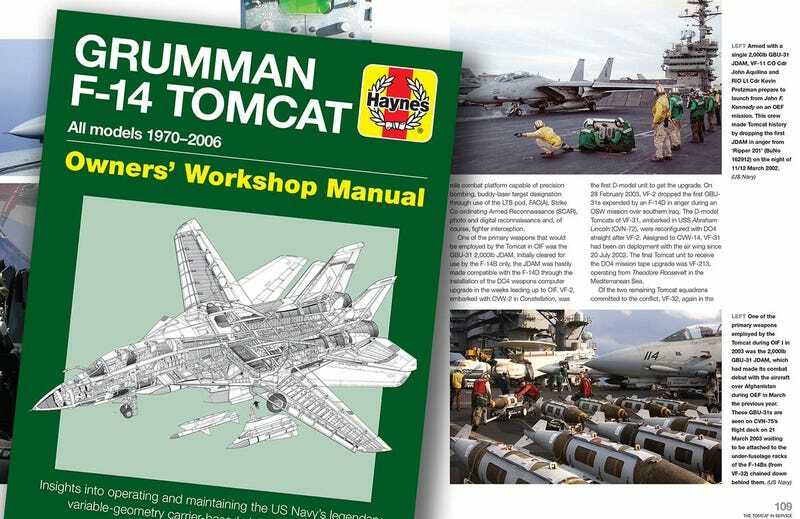 The Grumman F-14 Tomcat Haynes Manual promises to provide “insights into operating and maintaining the US Navy’s legendary variable-geometry carrier-based air-superiority fighter,” for all models of the F-14 in service from 1970 to 2006, which would seem to include the F-14A, F-14B, and F-14D models. Which is all very useful, if you still have one. Which you shouldn’t. Really, you shouldn’t. While there are plenty of fans of the F-14 Tomcat out there, owing to its movie popularity, speed, looks, technology, and the way it, uh, killed people, owning one can get you into a lot of trouble, unlike other retired fighter jets. And that’s because of its complicated early history. When the F-14 was first being developed in the 1970s, the United States government was looking for buyers. The program was extremely expensive, as most fighter jet programs tend to be, and if a foreign buyer was found it could go a long way towards offsetting the cost. 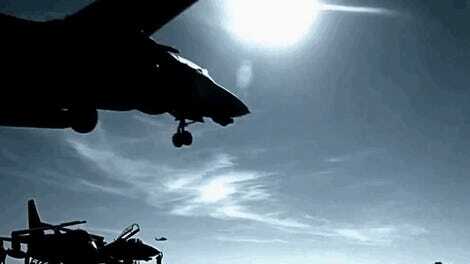 No one, besides the Americans, really saw a need for a plane as fast, complex, and advanced as the Tomcat. A U.S. Navy F-14 flies over northern Iraq in 2003. Nobody, except Iran. While Iran and the U.S. might be sworn enemies now, back in the 1970s Iran was run by an American-backed dictator, Shah Reza Pahlavi. The Shah wanted a way to stop the high-speed, high-altitude reconnaissance flights being flown over Iranian territory by Soviet MiG-25 Foxbats, and the F-14 (combined with its ultra-long-range AIM-54 Phoenix air-to-air missile) fit the bill. So in 1974, the Imperial Iranian Air Force ordered 80 F-14 Tomcats and 714 AIM-54 Phoenix missiles to go along with them. Most of them were delivered, and Iranian pilots were being trained in the U.S., before the Shah was deposed in the Iranian Revolution of 1979. Over the next decade, the number of F-14s in Iranian service dwindled. Some of the losses were due to American sabotage of the Iranian planes, some were due to losses in the Iran-Iraq War, and some just through a lack of maintenance, as Air and Space Magazine wrote back in 2006. But Iran has managed to keep a number of the jets flying, often thanks to a combination of ingenuity, reverse-engineering, and outright stolen parts and plans. But even though the F-14 is still fundamentally based on 1960s and 1970s American technology, it still represents one of the most advanced fighters in the Iranian Air Force. Rumors abound of Iran even using the F-14's (relatively) powerful radar as sort of an ad-hoc AWACS plane, guiding other fighters onto targets. And since American foreign policy is now to generally inhibit the Iranian military, what with its nasty habit of turning up in all of the world’s worst Middle Eastern war zones and generally befriending dictators the world over, its American policy to get rid of any F-14s it sees. 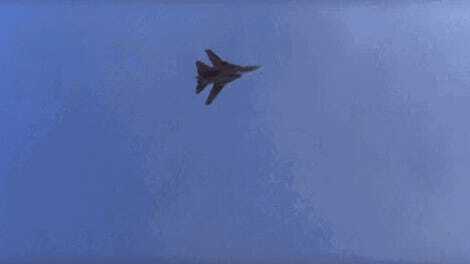 A mechanical monster grabs the F-14 fighter jet and chews through one wing and then another, ripping off the Tomcat’s appendages before moving onto its guts. Finally, all that is left is a pile of shredded rubble. The Pentagon is paying a contractor at least $900,000 to destroy old F-14s, a jet affectionately nicknamed “the turkey,” rather than sell the spares at the risk of their falling into the wrong hands, including Iran’s. There are still a whole bunch hanging around museums today, but they’ve been “de-militarized” completely. Depending on the jet, it could be one that’s been chopped in half and welded back together, rendering it unable to fly. Or, more likely, it’s been completely stripped of engines, computers, and mechanicals, rendering it mostly nothing but an empty shell. Former U.S. Navy F-14s awaiting the chopper back in 2007. So that’s where your Haynes manual would come in, normally. Snag one of those books and you should be good to go, right? Just a book, a little elbow grease, and your slightly used and chopped F-14 should be good to go, right? You Thought Cooking Your Turkey Was Tough? Try Maintaining An F-14! “There are no step-by-step repair sections as in a car manual, but they would give a rough idea of the machine’s workings,” they said. Oh well. I’m sure it’ll still be an interesting read.